With the emergence of Direct Access Trading in the market, there is now a multitude of ways to execute your order to buy or sell stock. This will largely depend on the brokerage firm that holds your account, as well as the type of account you are holding. 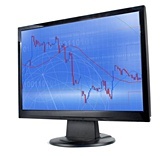 A great majority of day traders and investors use a Simple Electronic Access type of account. In this type of account, the burden to go out and actually hunt for shares within the stock market system to fill a buy order or to hunt for buyers to fill a sell order is absorbed by the brokerage firm. In other words, the investor simply needs to specify to the broker, generally through Internet access, some basic conditions in order to fulfill his investment or trading intentions. Specifying the stock symbol, the intention to buy or sell, and the number of shares to trade, the customer must also indicate certain conditions to execute the order. Electronic Communication Network (ECN) - ECNs give the trader the ability to directly communicate and trade with other traders or investors without having to go through market makers. While ECNs were incorporated into DAT with the NASDAQ only in 1997, ECNs are now allowed to participate in the listed exchanges (NYSE and AMEX) as well. "Smart" Routes or Macros Keys - Smart routes are algorithms that a specific type of DAT software uses to assist the trader in buying or selling stock without having to push so many buttons to hunt for liquidity. Smart routes are not a specific trading system – they are merely "macro" or "hot" keys that contain a set of instructions on how a specific trader wants to send out buy or sell orders based on certain conditions. These instructions can be customized by the trader or are simply pre-set by direct access brokers or trading software developer. There are a multitude of ways smart routes are configured, all with the intention to make the search for liquidity easier for the trader. In the trading of equities, the method used to route orders is an important one because of the potential for small price improvements and in many cases, being able to place the right kind of order during "fast market" periods. Since the modern stock market is made up of several "sub-markets" (ECNs and market makers), a trader's aptitude in the use of proper order routing to find the liquidity he or she needs to get the order executed is quite essential, especially on the NASDAQ. While small price improvements may seemingly have little significance to a particular trade, price inefficiencies in order executions can collectively add up to a significant amount over a long period of time. This is especially the case for traders who tend to be more active. For example, while a 5 cent differential in a trade may seem to be insignificant, this equates to $50 on a one thousand share order! Taken collectively on a set of trades over a long period of time, these $50 inefficiencies can add up to several thousand dollars only because of order placement. Also, the ability to correctly and efficiently route an order, especially on the NASDAQ, is extremely important during "fast market" periods, where a trader needs to find the liquidity in the market in order to get rid of open positions, or conversely, to initiate new ones.